My neighbor Tom has had these flowers in his front yard for several seasons. With my shoulder still out of commission, I had the time a few weeks ago to get a few photos for inspiration in my art work, while the flowers were in their peak. AND it got me out of the house, doing something different for a few hours! As you know, I enjoy researching the meaning of various flower varieties and Toms’ Iris was no exception. The word Iris means “a rainbow. Iris is the flower of the Greek Goddess Iris who was the messenger of Love. Ancient Egyptian kings marveled in the Iris’s exotic nature, and drawings have been found of the flower in a number of Egyptian palaces. In Chinese culture, the Iris has been recognized as the dancing spirit of early summer. Its soft, fluttering petals remind the Chinese people of butterfly wings, flapping gently in the breeze. The flower is known as Tze Hu-tieh or “The Purple Butterfly.” Hope, the last to escape from Pandora’s Box, helps man to look forward to a new day after all difficulties have passed. Therefore, in the language of flowers Iris also symbolizes hope and eloquence. Sending a card of an Iris would mean giving hope to the receiver and also hoping that there are good times ahead. The meanings of the Iris has come to include faith, valor, compliments, promise in love, and wisdom. The meaning associated with Iris flowers makes them the best medium to express truth and trust in a relationship. 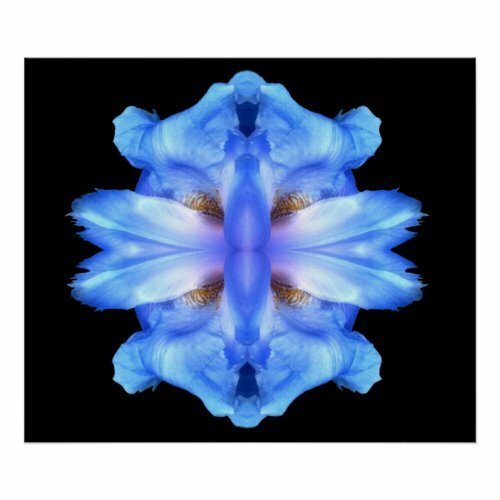 The many meanings of the Iris makes the flower a great choice for an array of gift giving/card sending occasions: corporate, sympathy, get well, just because, and birthdays are just some of the occasions for which Irises might be the perfect choice. And of course, many brides are including the Iris in their wedding themes. I found that there are other Iris flower meanings too, such as wisdom and heroism. The Iris has been matched with the universal heroic qualities of courage and valiance. Thus, for all these qualities, Iris is still loved by people who wish to speak the language of flowers. Today, the Iris is the state flower of Tennessee, and the Fleur-de-lis is the emblem for the city of New Orleans. 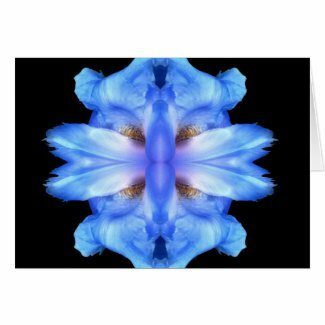 I again, invite you to stop in the Zazzle Gallery to visit the variety of flowers that I’ve taken artistic liberties with! Most everything I’ve created is available in High Quality Posters, Greeting Cards, Post Cards and United States Postage. I’ve even included a few of my favorite pieces on coffee mugs! Some of which would make great housewarming gifts! This entry was posted in Appreciation, Blank Greeting Cards, Bridges, Chinese Culture, Coffe Cup, Deep Purple, Easter, Egyptian Art, Fall, Floral, Floral Greeting Cards, Greek Mythology, Holiday Cards, Iris Meaning, Iris Painting, Iris Photography, Native American Folklore, Posters Cards Gifts, Rural, save the date cards, Spring, Summer, Thank You Cards, wedding designs, wedding invitations, wedding planning, wedding postage and tagged Acient Egypt, Appreciation, Asian Flowers, back to school cards, birthday cards, Blank Greeting Cards, Boys Town Reunion, Bridges, Calla Lily, Camera Filters, camera lenses, Chinese Culture, christmas cards, Coffe Cup, Custom Postage, Day Lillies, decorating ideas, Deep Purple, dennisbuckman com, Digital Art, Digital Photography, Easter, Egyptian Art, every day greeeting cards, Every Day Greeting Cards, Fall, Family, filters, first class designs, Floral, floral designs, Floral Designs, Floral Greeting Cards, Floral Paintings, for any reason cards, friendship, friendship cards, Gardening, graduation cards, Greek Mythology, greeting cards, Holiday Cards, home made camera filters, home remodeling, Interior Decorating, interior decorating ideas, Iris Gardening, Iris History, Iris Meaning, Iris Painting, Iris Photography, Iris Symbolism, living space designs, midwestern artists, Native American Folklore, nebraska artists, Posters Cards Gifts, professional photography, Purple Flowers, redecorating, Rural, rural art, save the date cards, Spring, Summer, sympathy, sympathy flowers, Thank You Cards, unique art, wall hangings, wedding designs, wedding invitations, wedding planning, wedding postage. Bookmark the permalink. Fantastic words and image Dennis! !